The White House's recent Reform Plan to transform government has many implications for anyone in the US Federal Government space dealing with digital Government to Business service delivery. That said the directions being taken are equally of interest for those in American state and municipal governments and even jurisdictions outside the US. Its plans for consolidation and bringing together across government a range of core services is a great step forward in better meeting the needs of American businesses. In this episode I look at the proposed changes that specifically relate to economic development functions and how they relate to the digital channel. 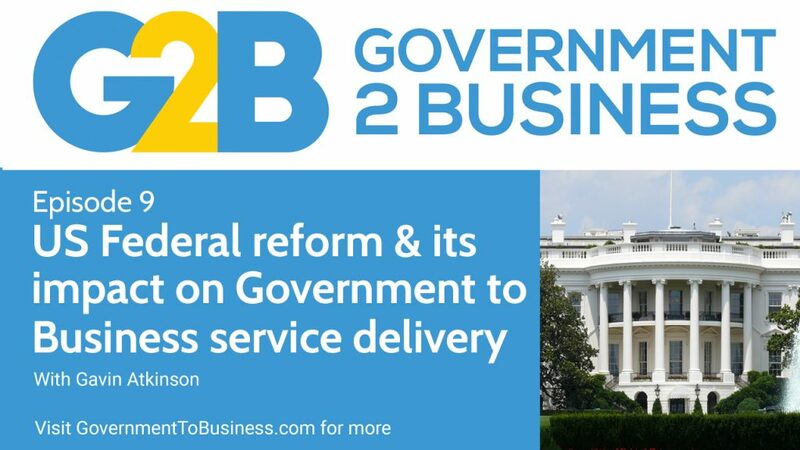 This is the first in a series of episodes looking at the US Government Reform Plan and its impact on Government to Business digital service delivery. What are the direct impacts of America's federal reforms on Government to Business digital service delivery? Gavin: G'day folks, welcome to Government to Business. My name is Gavin Atkinson and today we're going to be looking at the White House's recent report, which was basically reforming the whole of the US federal government. It came out as a consultation document recently. It's called the "Delivering Government Solutions in the 21st Century: the Reform Plan and Reorganization Recommendations from the Office of Management and Budget." municipal government in the United States. Or for that matter to be perfectly honest and frank, if you're anywhere within the world there's a lot of things that come in this particular report that are equally of interest to you because it really sets a clear direction for where the United States is presently looking at moving its Government to Business service delivery online. And that's absolutely critical for you and what you do as an actual senior executive within your jurisdiction because you need to be looking at where exemplars are exactly existing around the world, whether it's in your backyard or literally it's on the other side of the globe. Because we can all learn from each other in this particular space. And this particular document really is about positioning the US Government to rethink its service delivery and its overall approach to IT. It recognizes that, you know, government - and this won't be any surprises to any of you around there - faces a significant challenge where it's actually structured in American parlance, stovepipes. I think some other areas in the world might call it like silos, you know, basically an area where you've got responsibilities within a particular department or an agency or an organization or a ministry. And as a result everything is basically looked from an actual internal perspective rather than actually the customer view of the world and the report recognizes its highly inefficient. And a major cause of frustration to the customer because it's not creating the joined-up integrated experience for them. Now putting aside whatever your own personal perspectives are on Donald Trump, love him or hate him, what is important here is the moderating message actually in the proposed reform plan. It's sets a very clear conciliatory tone. And I'll give you an example, is there's a quote from here saying it's building on a history of bipartisan government reform initiatives. And then it goes on to name-drop both Republican and Democrat presidents from Carter to Reagan to Clinton, George W Bush and Barack Obama. And it's all about the need to make government more efficient, more effective, more accountable and having a core focus on reducing duplication. Generally speaking the reform plan also establishes a clear set of customer centric principles with a very strong focus on both citizen and importantly Government to Business services. Now during this particular episode of the podcast I'll actually be quoting from the report a number of times and that's because I really want to kind of capture the essence of what's in there. "Federal customers ranging from small businesses seeking loans, to families receiving disaster support, to veterans expecting proper benefits and medical care deserve a customer experience that compares to or exceeds that of leading private sector organizations which most federal services lag behind. The executive branch must develop capabilities to better facilitate end to end customer experiences that cross agency boundaries and create faster, more convenient and more cost-effective interactions." Well, that's a really well-positioned, you know, particular leading statement, but then it gives other examples, little vignettes around small business and how government can improve their service delivery experience. So to that end there's no real surprises when the reform plan compares and contrasts the contemporary multi-channel customer experience that you and I deal with on a regular basis with our own personal experience from a private-sector point of view. What are businesses, private sector businesses, currently delivering to their customers and comparing and contrasting that with government which it basically portrays as being rather outdated and clunky and some of you will have probably had that experience also as a private citizen dealing with government yourselves. Although of course we're obviously looking at things from a business' perspective. "Americans routinely shop online use smartphones to order rides and get electronic money transfers services and yet are forced to deal with multiple agencies and excessive bureaucracy when they interact with federal agencies. Lengthy permitting for infrastructure projects, confusing and overlapping job retained training programs and Byzantine requirements for applying for small business and farm loans, all are calcified and entrenched in outdated organizational constructs designed decades ago." That's an amazing statement there, and I'm sure hearing that a few of you are going, "Yes I can kind of see how this applies to my own jurisdiction." And that's why this particular report is so relevant to everybody within the Government to Business space. So look incidentally I'll mention up front right now, if you want to have a read of the report, it's a hundred plus pages, but that being said you can really cherry-pick a fair amount of it. You can download it from the URL of https://performance.gov/GovReform, that's G-O-V-R-E-F-O-R-M and that will take you right through to the landing page where you can actually download the PDF document. Now the reform plan at this point starts jumping from being, setting the scene for things to actually dealing with a suite of government-wide reorganization proposals. Now, some of these are foundational and they're all about building capability or frameworks for other proposals and many of them are understandably aimed at citizens. We all know that's overwhelmingly the largest aspect of service delivery from government. Depending on where you live it might be, you know, around about, you know two-thirds of citizens or three-quarters of citizens, and the rest is usually business. Which is obviously what we love and care about. But there are quite a few really interesting proposals that are actually aimed specifically at Government to Business service delivery and raising that bar. Now a number of these are actually really, really good. And if you haven't read the plan, I want to share those particular examples with you and again, it doesn't matter if you're in the US and you want to kind of be aware of what's going on, or if you're outside of the US, it's really interesting for you. As a side point, I guess in the world we live, it's not surprising for the actual reform plan to sometimes set centralizing directions, but strangely enough at other times very decentralized models. And this is actually I found a really a surprisingly refreshing approach to see a government not go "all in" to either a centralization model or a decentralization but to use that old English idiom, it's a case of horses for courses. And for those of you who aren't English language speakers as your naural primary language, basically it's all around about picking and choosing what's going to be the most appropriate strategy and tool for the particular given set of circumstances and not applying a blanket strategic aspect over the top whether it's centralization or decentralization. Okay, so what are the actual specifics in the White House's reform plan that relates to digital Government to Business service delivery? So the first one I want to touch on is the creation of a Bureau of Economic Growth. Now this brings together bits and pieces across the United States federal government. Its first up a reform package that proposes creating this Bureau and looking at aiming at coordinating and consolidating Federal economic assistance resources. Now it aims to create a central place for grants and technical assistance to communities and more importantly from our perspective, also for entrepreneurs, focusing on job creation and business growth. The Bureau aims to act as an enabler, supporting and empowering state governments, local governments and tribal governments in the United States to boost their own local economies based on the individual local development considerations that they have. So again this is one of those great examples of where there's no one-size-fits-all. Its tailoring based on the local conditions there. So the bureau's proposed programs will provide training and business development assistance to help businesses regardless of their position in the business lifecycle. Now to achieve this the Bureau of Economic Growth is proposed to have three perational arms to achieve that particular mission. The first one is a Planning Office, which is, endeavors when it's created to engage state, local and tribal development agencies, identifying each of their community's particular barriers to economic growth and to set community SMART goals. So I'm sure all of you are very familiar with SMART goals - goals that are Specific, Measurable, Actionable, Relevant and Time-bound and then taking that through to the planning process so that these local agencies would be able to create their own criterion milestones to measure the effectiveness of subsequently awarded grants. So the idea being here is it's kind of creating the preconditions upfront for how things will be assessed when you're looking at creating and awarding any of those grants and assistance at a local level. And this makes a lot of sense, but it needs to obviously be done with an overlaying lens applied to assess, you know, where a local agency is setting relatively ineffectual goals or for that matter, way too overly ambitious goals. So one thing I think that'll be absolutely critical in this particular space is the assessment process to ensure that the planning phase delivers the desired benefits and that's going to be hard early upfront when people don't really know, sorry individual development agencies around the United States don't quite know how to approach this. There's a lot of different ways of approaching this and I think it'll take a little while for the Bureau to actually work out what's a, you know, what's a right way to do things and approach things. Probably take a couple of years, maybe three years. So we'll see how that one goes. The second operational arm within the Bureau proposed is an Office of Grant Making. So once the local area, the state, the local municipal government of the tribal government has completed their planning process the applicants of the local agencies will then make an application through to the Office of Grant Making for the actual funding to implement their plans so that they align with the agreed goals. The Office of Grant Making will then craft some criteria to assure that the implementation activities are sufficiently comprehensive, actionable and consistent with the applicant's plan. So I think this is good where you're actually starting to have some consistency going across the board. So you making sure you're allowing for that local level participation and identification on what the key problems and the key goals are. But also at the same time there is some overall framework that's encompassing all this and how it's kind of going to work. And I think that's critical. It's again that mix of the best of both worlds. At a high level this all makes a lot of sense. But I'll actually be interested obviously in seeing a little bit more detail for how this is going to work and operate. The third arm of that particular Bureau is the Office of Technical Assistance and it will actually work directly, and this is interesting here, with nonprofit and educational organizations within those local areas, within those states, within the municipal governments - sorry not municipal governments - within cities, towns, etc, counties and tribal areas to build the capacity through a strategic and operational training and a dissemination of best practices in economic development to local businesses and practitioners. So those nonprofits will then apply to the Office of Technical Assistance to fund technical assistance activities that support the community economic development plan. So that particular Office of Technical Assistance will also provide access to assets that support the nonprofit's implementation. Now that's a particular quote from the document. That's a little bit unclear what they mean by "providing access to assets to support nonprofits implementation." So while local solutions are needed for local problems, obviously, there's this scope potentially for platform sharing I think in this particular space and what's important here is you really don't want to have a situation of the wheel constantly being reinvented where the the Bureau of Economic Growth is basically providing funding to hundreds, literally hundreds of different local areas across the United States and let's say a quarter of them are all doing the same type of thing. Sure you need to kind of contextualize things for local conditions, but there's going to be some underlying aspects that are always going to be the same. So I think having some, a kind of core kernel there with some flexible and scaleable non-technology dependent modules could really assist. Because they could be called upon and then be repurposed at the local level for those local conditions within those particular areas. Maybe that's what's meant by that particular obscure quote of "Providing access to assets to support nonprofits' implementation," but its not really clear. I guess the other thing that I should probably touch on and I didn't, I should have done this straightforward up front is the fact that this particular Interaction between the Bureau is not being done necessarily with the actual local development agencies. It's not being done with the state governments. It's not being done with the local governments and not been done with the tribal governments. It's actually being done directly with those local nonprofits and educational organizations in those areas. It's all around about creating that initial stakeholder relationship management I guess it at the government level. Determining the criteria, working out how this is going to work and operate. And then it's handed over effectively to these nonprofits and educational organizations to deliver. That's an interesting model again the United States has generally gone down this particular path of government assistance and support through to nonprofits to be able to and educational institutions to be able to help grow the development capability of businesses and entrepreneurs. Yeah, it's something that again I think that's part of that culture within the United States in this particular space. And it's something that if you're within your jurisdiction you don't look at it's at least worth looking at and examining about whether that model is something that's worth considering or whether you kind of keep all the the goods in-house so to speak. Anyway, so let's move a little bit more and just kind of wrap things up when it comes to the Bureau of Economic Growth. So the reform plan clearly avoids any unnecessary duplication of staffing and resources, but actually not having the Bureau of Economic Growth replacing the nonprofits. And that's what I mentioned before. It's not doubling up in that sense. It's just kind of giving them the keys to the kingdom so to speak to organize at the local level. That said the following sentence in the plan muddies things a little bit in my view which is, "Recognizing the unique challenges faced by small businesses, this proposal does not include the Small Business Administration's Office of Entrepreneurial Development which provides planning and educational services exclusively to small businesses." The question that's not yet clear in my mind and maybe this is something that someone outside the US, like myself wouldn't intuitively be able to identify, is the crossover between supporting small businesses between the nonprofits and educational institutions and Small Business Administration, which is the SBA, that's the main federal government organization looking after support for small business in the US. It seems that both actually potentially will be catering to the same audience with a potentially similar set of services and products. Again I'm a bit concerned that there's this very strong philosophy going through the reform plan about avoiding duplication, but it's not really clear about how in this set of circumstances that duplication will be avoided. Maybe at the next stage of the plan as this is developed a little bit further that might become clearer. The second element that I want to touch on, another one of the programs in the document, is the consolidation and streamlining of financial literacy efforts. Now this part of the plan identifies that more than 20 federal government agencies currently provide some form of financial education or literacy program and while understandably most of those are citizen-centric, the plan actually recognizes it also applies to small businesses who often don't have the initial financial skills. Now whether that's compliance with tax, employment or other regulatory aspects. Or the core basics of profit and loss statements, balance sheets, pricing strategies, all those type of great things. The plan flags that $170 million US dollars a year actually goes into technical assistance in education for entrepreneurs from the Small Business Administration, the SBA. Now it also makes it clear that not all of that $170 million dollars goes into financial literacy but obviously identifies it as being a component of that. So the plan proposes at a high level to consolidate programs into fewer agencies, which I think is really good, but doesn't necessarily discuss the strategy for where this would exist and how it would be implemented for business owners. So again, this is one of those things where at a high level, you know, you kind of expect it to set that overarching strategy and view of where the US federal government wants to go. But yet that next level down, the next level of detail it's not entirely clear how this particular aspect will work and operate. And again I do hope to see as it's unpacked a little bit further, when it comes to its implementation, that'll become clearer. The third particular program that is very much related to Government to Business service delivery is relating actually to the Small Business Administration, the SBA, and it's all around streamlining small business programs. Now, there's a very, very strong focus here consolidating two key areas: centralizing basically the government contracts through to businesses and its purchasing and also access for businesses to financial capital to be able to get started and to grow and so forth. Now, I've mentioned the word "consolidate" a couple of times now in this particular podcast and that's because this is a theme that runs all the way through the reform plan. I actually did a quick search across it. There's a hundred and sixty instances of the word consolidate or consolidating or consolidation and the word "duplication" isn't too far behind at sixty-four instances. So there's really no surprise that this part of the plan looks at improving the service delivery of these two programs by centralizing the activities. So this is one of those times where centralization kind of kicks in and whether it's contracts or capital access this particular proposal recognizes, that's not just a technical solution, the reform playing flags that the existing environment across the federal government in the US has inconsistent standards, inconsistent processes for eligibility, there's a lack of reciprocity between agencies and programs. So whilst you might be eligible for one set of program, that's very similar in another agency, It's not, you're not eligible as a business. So and also recognizes this, you know, due to all this complexity there's just great inefficiencies and a total miss of opportunity for achieving economies of scale. All of this needs to be considered I suppose in that consolidation process of creating again, quote-unquote "one-stop shops", which is another key message that comes through the particular document. Now what's interesting I suppose in the contract space is where consolidation is proposed, it doesn't actually say it's a total centralization. It's actually not a one-size-fits-all approach. So where there are targeted industry specific expertise that's required within that contracting and purchasing space, the Small Business Administration would defer actually through to the other government organization and move its services from them to that other government organization, federal government organization. Now the plan doesn't say what areas this would include but I'm assuming it's going to be more in that highly specialized or sensitive areas such as military, aerospace and other applications rather than the staples of government purchasing. As I mentioned a few moments ago, the overarching planned consolidation of programs is a really great step forward but doesn't discuss the strategy of where this would exist actually for business owners. And this is the main challenge I feel for the reform plan. Yes, it does consolidate and eliminate duplication in many areas, but there doesn't seem to be an underlying strategy of bringing together from a customer-centric point of view of all Government to Business services into a single one-stop shop or platform. Instead it's a number of one-stop shops, which while a step forward - unless the customer experience is integrated together - leaves the job only half-done. Now consider the areas that we've talked about so far: grants, technical assistance, financial literacy, contracts and purchasing, access to capital. They all seem to be brought together, but without a natural integrated customer strategy. But still look, it's a big step forward and sometimes that's all you need to get the ball rolling rather than a big all-encompassing bang. So incidentally I do hope that this proposal or a similar one dealing with the Small Business Administration would also address the the relatively poor customer journey and experience for businesses affected by natural disasters which I wrote about in the blog about Hurricanes Harvey and Irma last year and looking basically at better joining up and integrating disaster support across the US Federal Government. But I guess that's for another day. So, while the reform areas I've discussed up to now are specific to business customers of government, the remaining three are all about capability development and a great step forward for how government agencies can improve their digital service delivery for the business. But I'll be addressing those next week because what I've talked about today is a lot to kind of get your head around. So I look forward to catching up with you next week and don't forget to subscribe to the podcast and if you've got any questions or queries always feel free to give me an email: Gavin@GovernmentToBusiness.com and I look forward to speaking to you very soon. 0 Comments on "Podcast episode 9: US Federal Reform and its impact on Government to Business"